Tableau outstanding and remarkable features and services are what make it the perfect tool for improving profitability. 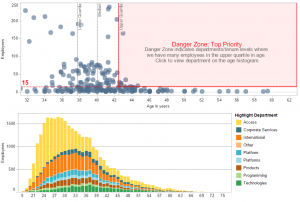 It can help you to better understand trends and explore trade-offs and share that insight with colleagues and use it to find creative solutions with Tableau Desktop. Manage labor hours and productivity and understand staffing trends. Identify areas of risk with what-if planning. Audit Equal Opportunity Employer (EOE) issues such as gender and race. Avoid security snafus by keeping employee data secure but shareable with authorized managers, right in a web browser. 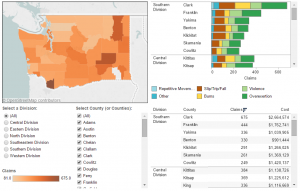 Identify and mitigate risk This dashboard provides insight into the number and types of claims made within a given company with locations in many counties in Washington State. Very quickly it becomes clear as to the location of the largest amount of claims – Clark County. This might be surprising since there are far fewer people located in that county as opposed to others, and perhaps requires some further investigation. By drilling into the details, we can see the breakdown of the injury causes as well as the cost to cover these claims. Avoid waste by analyzing resource allocation Hire too little and growth and quality suffer. Hire too much, and costs go up as productivity goes down. Companies need sophisticated HR analytics to ensure that they’re well covered for key positions but not over-saturated to avoid waste of time and money. Tableau lets you monitor trends in demand as well as drill into more specific details so you can find areas to be more productive. 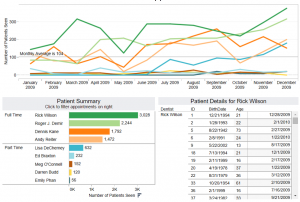 The dashboard lets you select a particular dentist to see the monthly trend in visits. Select a given dentist to view his or her patients profile. Such information can identify areas of expertise and help you target your marketing spend or hiring decisions. Identify patterns in hiring, firing and promotions across your company Until you collect all of your personnel data and look at it you don't know what is really going in your workforce. This dashboard gives a simple and clear view into how many people are changing positions, joining or leaving the company. Hiring is up, but transfers are down. The lower views show last year's performance rating broken down by supervisor, employee type and terminations by group. This type of analysis can be done by any Excel user in Tableau Desktop, and you can share the results with managers via Tableau Server-- securely, right in a web browser. Use human resources analytics to manage your succession plan and avoid gaps in key roles Visual analysis can help you identify areas of risk that you otherwise might miss in a large workforce. This view shows all the groups in your company by age and number of employees. The groups that have very few and relatively older members need to be targeted for succession planning to reduce risk. Use data to help you set important HR policies HR policies affect employee morale and retention, as well as the bottom line, so it's critical to get them right. Use data to do what-if planning and calibrate your policies to get them right. 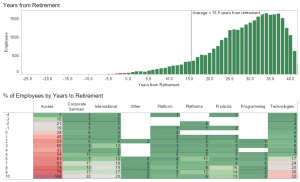 This dashboard lets you do what-if planning about your retirement age. The top view shows a histogram of employees by years from retirement. The bottom view profiles each group in the company, breaking each group down by percent of employees and time from retirement. Use the slider in the top right to see the outcome if you set policy at different retirement ages. simply by changing the age parameter you can better understand the effects of any policy that you set.